i finally finished priming all the trims in all the rooms except for the kitchen and bathroom (those are work in progress areas that will be completed once i move in), i received my missing unemployment check that i called the unemployment department about, amanda rawson (missing in action for well over half a year, the last time was that auspicious day that i found my current house 020324) aimed me today and i didn't see it before she logged off but at least i know she's alive, got the water bill from my upstairs neighbor and turns out it's not as bad as i thought it'd be, and my real estate agent wrote me a helpful letter answering a question about oil heater removal that i called him about but forgot to leave my new phone number. after buying another can of special enamel coat primer from home depot, my father went with me to cambridge to help finish up the trim painting. we got there at 11am and painted all the trims (except bathroom and kitchen) after 5 hours that went by pretty fast. we started in the guest bedroom, then to the master bedroom, and back to the hallway (the few areas i didn't paint yet). he had baseboards and ceiling trims duty, i did the windows. if he didn't help me, it would've taken me another day to finish the trims. this is good news because tomorrow i start the semi-gloss topcoat, and once i finish painting a room, that room is good to go, i can remove the tapes and start living there. tomorrow, the bedrooms will be done. it's sort of exciting to have the end so near now, but it's not a total ending because i still have the kitchen and bathroom to work on, but the important thing is i'll be living there. i had a late lunch at the cafe, then went back to belmont and took a nap, before heading over to dan's place in allston around 8pm to watch "a bad movie" and then go to the coolidge corner theatre to catch the thor concert (www.thorkorr.com). we ordered wings and picked up a video from videosmith, can't stop the music, the story of the founding of the village people (fact or fiction, who knows) starring steve guttenberg. elias showed up at 9pm, and dan's friend amy and her boyfriend bob came back to the apartment as well (did i mention cymara was there too?). i remember seeing can't stop the music on cable when i was younger, and i think i completely missed the overt homoeroticism saturating this film. it's great movie though, funny as hell, intensely high energy, and it's fun trying to determine who's the gayest character. and bruce jenner in denim short shorts and a half shirt? i haven't had this much fun watching a movie since there's something about mary. close to midnight we went down to the coolidge corner theatre in brookline to see the thor concert. elias's girlfriend amanda and roommate matt joined us. who is thor? thor is this cheesy muscular canadian heavy metal rocker who's claim to fame was starring in this terrible 80's b-movie where he plays a muscular heavy metal rocker (surprise surprise) who fights with the devil. 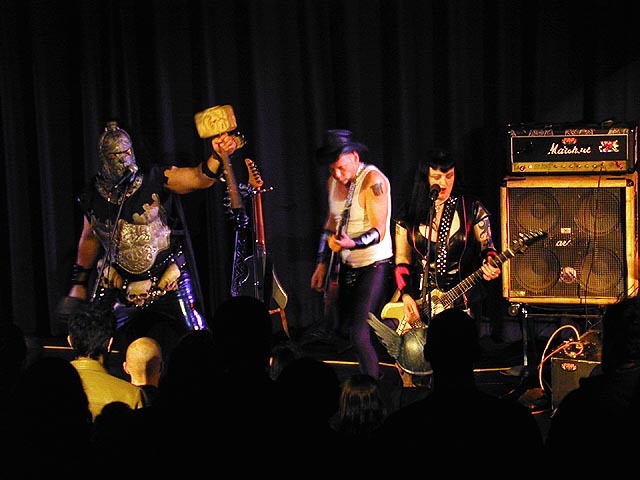 the concert featured two opening acts before thor came out, nasty disaster and damien storm. both acts were horrible, like amateur night at the coolidge corner. the fact that the theatre was having problems with the audio system didn't help much either. surprisingly, there were people who really got into it, especially nasty disaster, banging their heads, giving the devil sign, one handed and two fisted varieties. when it started to get rocking, i was scared for my safety and i kept on imagining a beer bottle smashing down on my head. nasty disaster was very sexual and misogynistic (thank god their microphones were consistently dead and it was hard to understand their lyrics anyway when i could hear them), and how damien storm even found his way on stage is a mystery to me, but he did have a nice david lynchian costume (all red with a bird mask). anyway, i thought the music sucked, and occasionally i'd stick in my earplugs to drown out the noise. it was bad enough (the music, not the volume) that some people left, but most people stayed, since we were all here for the main act, thor. amanda and matt left, after a crazed fan threw what appeared to be beer (they don't sell it in the theatres) from the back of the theatre into the audience. thor showed up close to 3am. by then we were all very tired, but the excitement of seeing thor (at the start of the concert they showed a super abbreviated version of his 80's horror movie) i think buoyed everyone's alertness. the members of his band played first to warm up the crowd before introducing thor himself. when he came out he was masked, and when he took off his mask, there was another mask underneath. during the whole concert, he would keep on changing to different masks, as if he couldn't decide which one he liked the best. thor must be in his mid-40's if not in his 50's, and the years have not been kind to our thor. no longer having his trademark muscle builder physique as seen in his movie, 21st century thor was overweight and resembled a football linebacker, all thick arms (no definition whatsoever) with a belly that could probably repel a cannonball. his music? we were really there just to laugh at him, his sound is just standard issue heavy metal noise, perhaps a throwback to the hair bands of the 80's. is heavy metal alive and well? at least people like thor still carry on the tradition, but the fact that his 40 city tour of north america brings him to a $10/ticket art house theatre venue goes to show you his level of stardom. we actually left during thor's final encore performance, having had just about enough of the rock warrior for one night (if not our lifetime). there was a rainy fog awaiting us outside. elias, his car parked nearby, went home on his own, while i drove dan, amy, and bob back to dan's apartment.